The United States Mint this week published images of the 2013 America the Beautiful Quarters. Until now, only line-art designs of the coins had been available after being unveiled themselves last month. It is standard practice for the U.S. Mint to release artist renderings of new designs prior to any actual coin imagery. The process starts long before artists submit design concepts and before a final design is chosen. Once selected, any requested changes are completed to the design before being officially unveiled. Then, dies are created of the design and coins are actually struck. Photographic images of the newly created coins are taken with those of the 2013 quarters available now. In this case, the images available are of the proof quarters — coins minted specifically for sale to collectors and sold within multi-coin sets. Coins found in circulation will not have the shine or mirror-like background that proofs do. This year’s 2013 America the Beautiful Quarters represent the sixteenth through twentieth of the program. Coins of the series are scheduled to appear at a rate of five per year from the inaugural releases of 2010 until the last of fifty-six new strikes have been issued in 2021. Obverses (“heads side”) of America the Beautiful coins contain the John Flanagan portrait of George Washington. This same basic design has appeared on the obverse of quarter dollars since 1932. 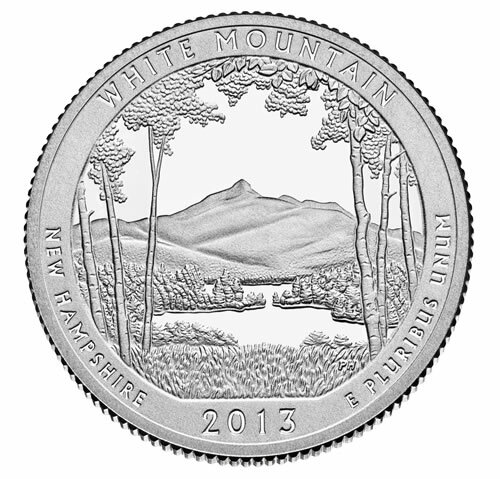 Depicted on the reverse of the White Mountain National Forest Quarter is a design portraying Mt. Chocorua, the easternmost peak of the Sandwich Range found within the national forest. Framing the peak is several birch trees indigenous to the region. Inscriptions include WHITE MOUNTAIN, NEW HAMPSHIRE, 2013, and E PLURIBUS UNUM. This reverse design was created and sculpted by U.S. Mint Sculptor-Engraver Phebe Hemphill. The reverse of the Perry’s Victory and International Peace Memorial Quarter offers a close-up view of the statue of Master Commandant Oliver Hazard Perry. Behind the statue, the doric column of the peace memorial can be seen. 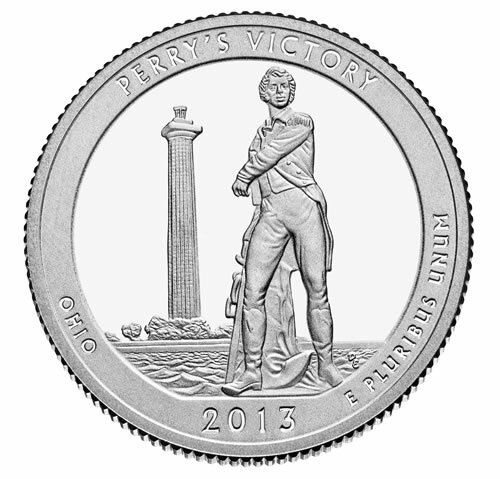 Inscribed around the design are the inscriptions of PERRY’S VICTORY, OHIO, 2013, and E PLURIBUS UNUM. The reverse was designed and executed by United States Mint Sculptor-Engraver Don Everhart. 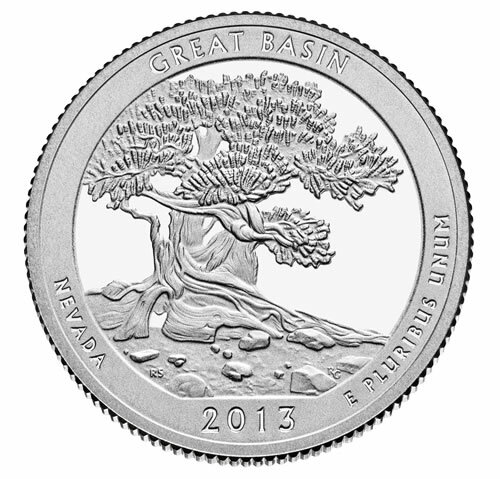 A single bristlecone pine tree is depicted on the reverse of the Great Basin National Park Quarter. It is found amidst the rocky glacial moraines of the park. Surrounding the design are the inscriptions of GREAT BASIN, NEVADA, 2013, and E PLURIBUS UNUM. The reverse was designed by United States Mint Artistic Infusion Program Associate Designer Ronald D. Sanders and executed by United States Mint Sculptor-Engraver Renata Gordon. A view of Fort McHenry during one of the annual “Defenders Day” celebrations is offered on the reverse of the Fort McHenry National Monument and Historic Shrine Quarter. In the air, fireworks can be seen emblematic of “rocket’s red glare” taken from the Star-Spangled Banner written by Francis Scott Key after witnessing a British naval bombardment of the fort in 1814. 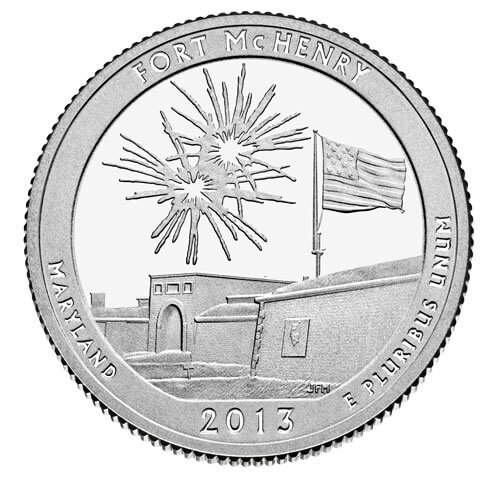 Reverse inscriptions include FORT McHENRY, MARYLAND, 2013, and E PLURIBUS UNUM. The reverse was designed and executed by United States Mint Sculptor-Engraver Joseph Menna. 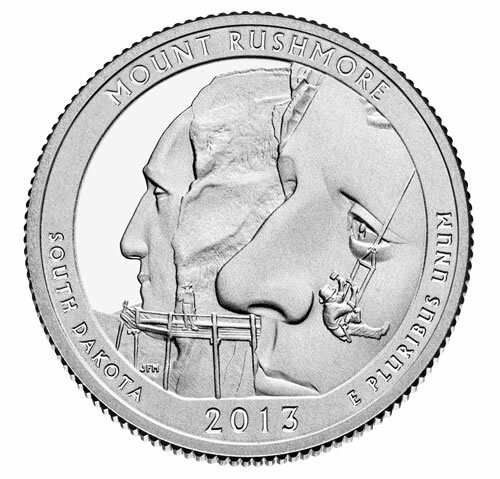 Offered on the reverse of the Mount Rushmore National Memorial Quarter is a design emblematic of the construction of the memorial. It depicts workmen completing the final touches of the face of Thomas Jefferson. Inscriptions are MOUNT RUSHMORE, SOUTH DAKOTA, 2013, and E PLURIBUS UNUM. The reverse was designed and executed by United States Mint Sculptor-Engraver Joseph Menna. The five 2013 America the Beautiful Quarters are scheduled to be released in intervals throughout the year, the first of which will occur Monday, January 28. These are when the quarters will be available in circulating-quality, and sold by the U.S. Mint in bags, two-roll sets and three-roll sets. Check this site’s section about the America the Beautiful series for current quarter news and information.